This week, Microsoft announced their 2018 Surface lineup at their October event, along with their semi-annual feature update to Windows 10. 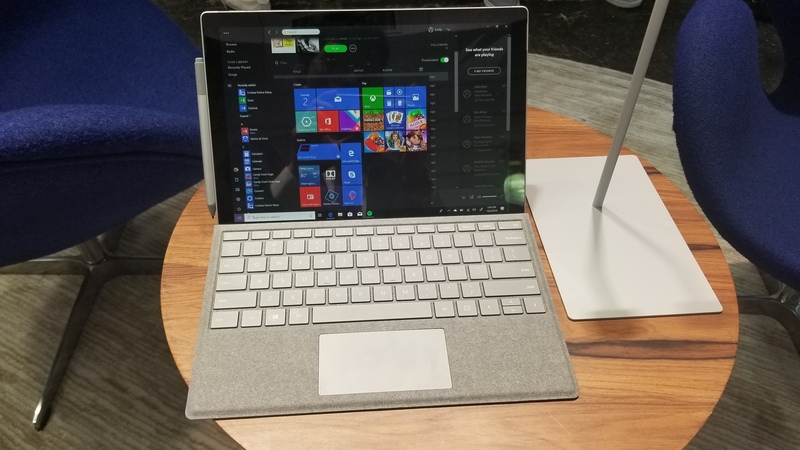 Afterwards, we had a chance to look and play around with the announced Surface devices: the Surface Pro 6, Surface Laptop 2, Surface Studio 2, and Surface Headphones. In terms of physical design, the three main Surface devices are virtually unchanged from their previous generation counterparts. 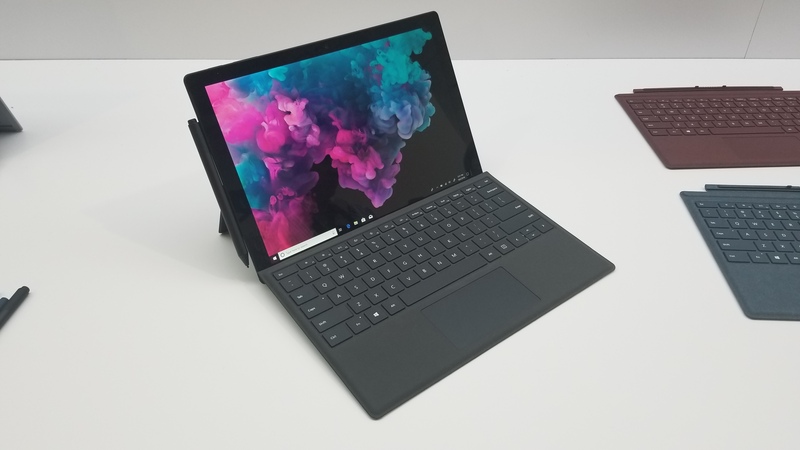 The Surface Pro 6 and Surface Laptop 2 now come with a matte black option, but otherwise both still lack a USB-C port like their predecessors. This is somewhat unsurprising as these are more iterative refreshes with drop-in processor/platform upgrades, but at the same time USB Type-C adoption is only growing, especially in mobile devices. Meanwhile, it would seem that both i7 models are being powered by the 4C/8T i7-8650U, which was previously seen in the Surface Book 2. As a result of this component selection, there’s no Iris GPU in any of the Surface mobile devices. This a consequence of the fact that there are no 15W Iris-equipped processors in Intel's 8th Gen Core catalog, whereas the 7th Gen Core family included a few SKUs. 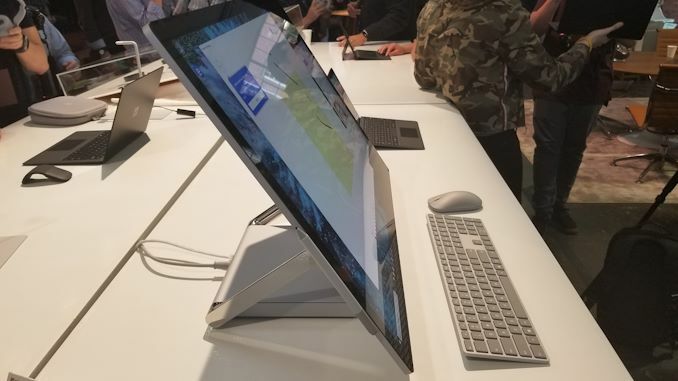 The Surface Studio 2 has a similar story, as the chassis and design is identical to the original. Component-wise, the Studio 2 is powered by an i7-7820HQ and drops the hybrid SSHD in lieu of a true SSD, the latter of which was essentially a mandatory change. The Studio’s GTX 980M has given way to a mobile GTX 1070 part, which is in line with the form-factor and thermal requirements, as well as the advertised 6 TFLOPS as opposed to the 6.5 TFLOPS desktop GTX 1070. Though once again at the tail-end of a GPU generation, there’s a significant degree of integration with NVIDIA’s drivers with some of the Studio’s advanced display-related functionality, touch/stylus and otherwise. Another big modification was in the display with its new oxide (IGZO) transistors and improved contrast ratio, which is somewhere in the realm of 1200:1. The brightness was also enhanced and Microsoft mentioned off-hand a figure of around 500 nits. And of special note is the improvement to thermals and reduced fan noise, particularly with the pitch of the noise caused by fan blade/size, but also with improving the vapor chamber cooling. The original Studio’s cooling fan and resulting acoustic profile were not the best, and much like the other changes, these improvements are in large part targeting the main flaws of the original. 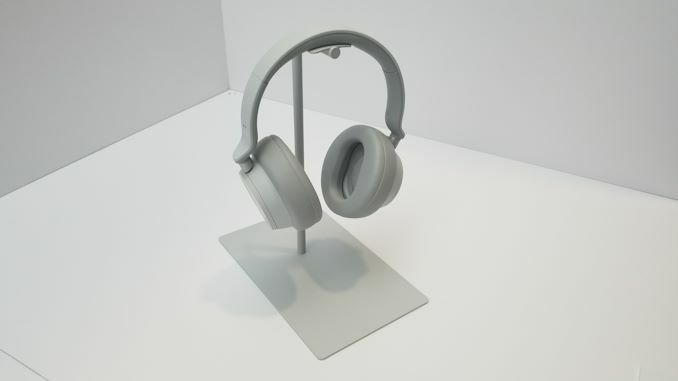 As far as the evolutionary refreshes of the computer lineup, Microsoft’s surprise announcement of the day was a Surface-branded peripheral: the Surface Headphones. Designed in-house, the full size Bluetooth headphones have some potentially handy hardware controls. Rotating the ‘rim’ of the right earcup modulates the volume, while the rim of the left earcup adjusts between the 13 noise cancellation levels. 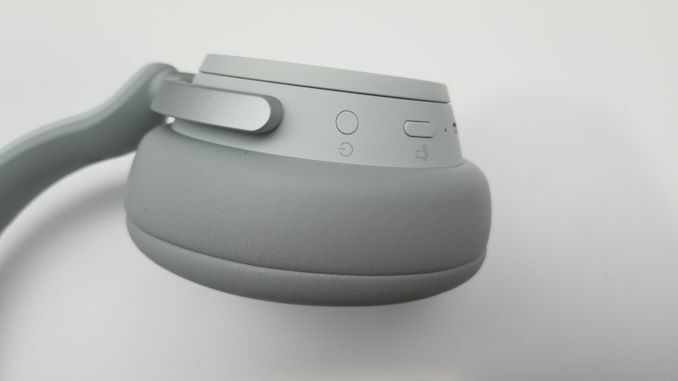 Tapping on the faces of the cup can toggle pause/play and track switching, and the headphones provide Cortana functionality thanks to some integrated mics; taking off the headphones automatically pauses any music being played. Charged via USB-C, Microsoft touts a 15-hour battery life. The headphone cups are of a smaller over-ear type with large comfortable pleather type earpads, and the build quality seemed standard. Subjectively-speaking, it’s the type of headphone that’s best gauged in this intended ‘on-the-go’ environment. That is, using the headphones in conjunction with a Windows 10 device and in non-stationary scenarios. Impressions-wise, there’s not much more that I can contribute, because a device like the Surface Headphones is not a good fit for me personally; I don’t use wireless or noise-cancelling headphones, don’t use my phone/laptop for music, and prefer using a separate DAC/amp even when mobile. But the idea is for the Surface Headphones to fit into a Surface ecosystem that is focusing making mobility and transitions seamless, either through Surface devices or Windows 10 featuresets. 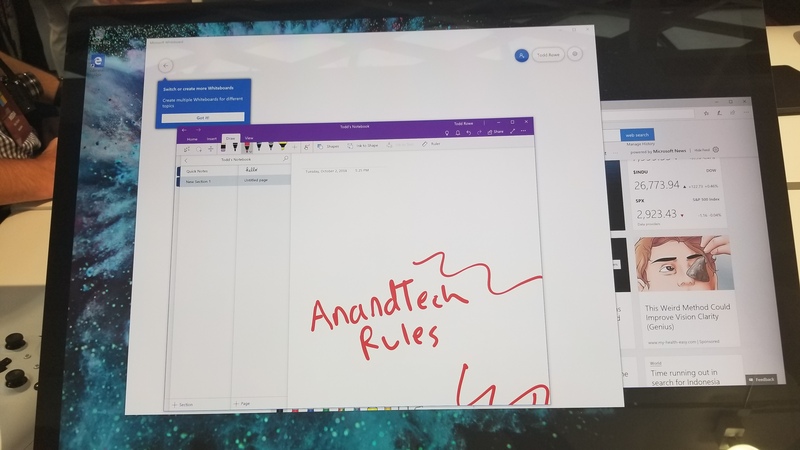 So if someone is already inclined to use a Windows 10 laptop (or Surface) and is often moving about or working in public spaces, I can see the device being an interesting proposition on grounds of convenience. The Cortana integration is what differentiates the Surface Headphones much more than its standard wireless or noise cancellation features. Ultimately, the internal improvements are really the meat of the generational changes, and of course it’s the type of enhancement that is not easily conveyed via a public hands-on event. Performance and battery life claims naturally fall under this, but the more subtle but important aspects like the Studio 2’s new display and improved thermals/noise. A better summary would be to consider this more in line with refreshes from the big OEMs; except as those occur less frequently with Microsoft, the improvements are certainly welcome, especially with the Studio 2. I'm not really surprised, the dropped the ball last year on this. 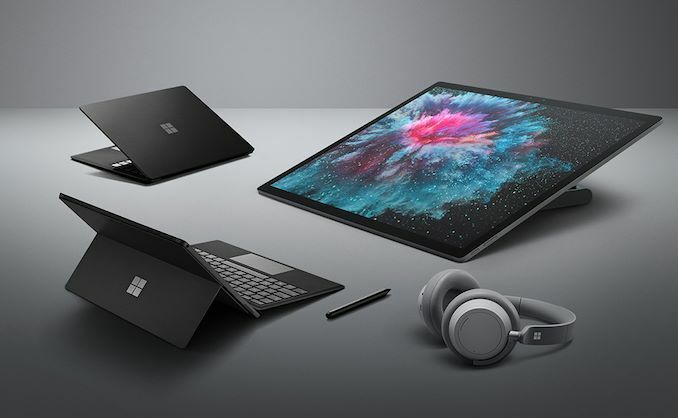 There must be someone in charge at Microsoft that thinks embracing USB-C is a leg up to Google or Apple. It's hogwash is what it is, any company that would produce a laptop, tablet or phone without USB-C is frankly just plain stupid and their products should be avoided. Except the connector is now common with TB and even DP over USB-C. So you have three different standards and even a combination in some cases. With the old USB-A standard, you plugged it in and, in general, it worked. There was no normal use scenario where you could plug it into a completely incompatible port. The variance was how fast it worked. With USB-C, you plug it in and it might work, but maybe not. Did you plug your TB device into a USB-C port? Not all the ports on the same laptop have the same compatibility. You have to check to make sure it supports the device you plugged in. This by itself says that it is not literally better than all the prior plugs in EVERY SINGLE WAY as you state. Beyond that, the majority of devices manufactured are still using the older usb standards. Even with phones, where USB-C is more prevalent, the devices are more often than not delivered with a USB-A to USB-C cable and a USB-A equipped power adapter. I totally agree that Thunderbolt 3 helped to kill USB-C adoption. It adds way too much damn complexity to a port that already does too many things in it's original standard. But Thunderbolt was on it's last legs, so I can sorta understand it going all-or-nothing. Unfortunately, we're now going to have to wait until Thunderbolt gets integrated into device chip-sets before they solve the "does this C port support this C peripheral" problem.